After our scurry in the desert with the asses, we took an evening flight back to Delhi. 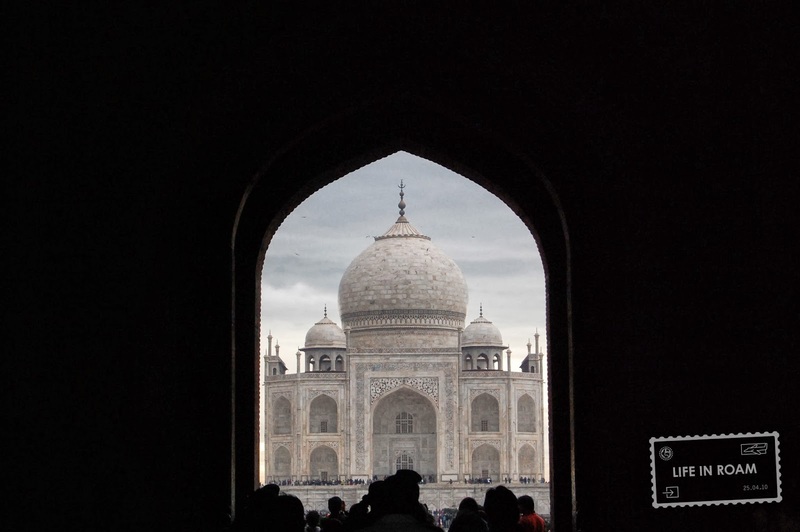 We didn’t want to travel to this far flung piece of the earth without seeing the Taj Mahal, but, the palace is located in a city that is a few hours from Delhi, so we didn’t know the best way to travel there. We found a ludicrously cheap day-trip from the government tourist department, so we signed up for it and hoped that it was not a scam. It wasn’t! How fortuitous for us! Before that though, we had a day in Delhi to explore, which has some good travel information to know about. This is actually the Red Fort in Delhi, and not the Taj Mahal. When we arrived from Ahmedabad, we took a pre-paid taxi from a government/police run booth in the airport. Do this. It’s the same price for white people as it is for indians, and it is easy and simple. If you are going into Delhi itself, there is a airport metro that no one uses, that is also fairly priced. It’s not a good deal though if you are a group of 3 or more, because the cost of a single taxi would be less than all of your metro tickets. 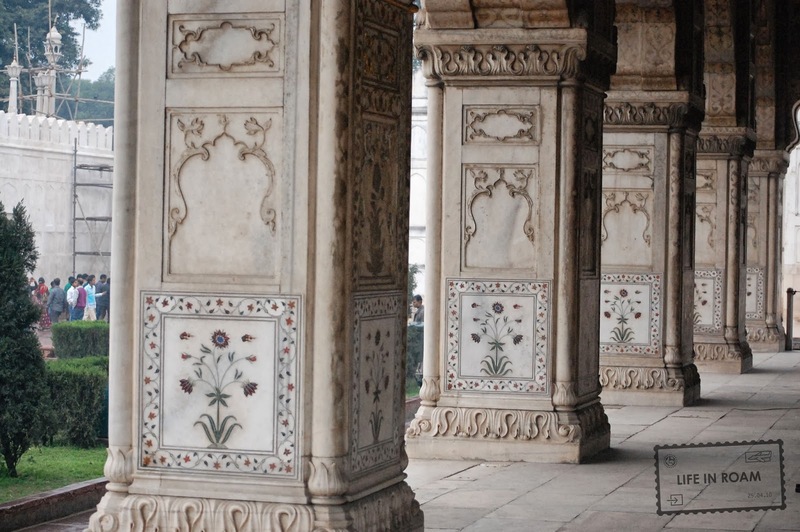 Old Delhi is a very interesting place to experience as well. Though, as warning, I would of curled up in a ball and cried if we had gone on the first day of the trip. The streets are crowded and the buildings lean forward as they go up creating an almost tunnel like experience. Goats and motorcycles meander and zip through the streets, but the people mostly ignore you. For lunch, we stopped at the highly recommended Karim’s. Traditional food, that was delicious. We didn’t have them, but you can even get lamb brains! The Red Fort, for us, was not that interesting. Okay, maybe it was just me, but I found it sort of depressing and unkept. There was a lot of buildings being renovated, others stood in magnificent glory with intense inlayed jewels and intricately craved marble, others have had their jewels picked out for souvenirs. To the Taj Mahal instead. We had to get up quite early to reach our tour, but as veteran travel warriors, we made sure it was nice and close to our hotel. Once we loaded into the 12-person van, we noticed right away the two other americans in the van. After engaging with the presumably gay couple, it was revealed that they were actually religious friends. One a pastor, and the other a member of his church. How embarrassing to get that mixed up. 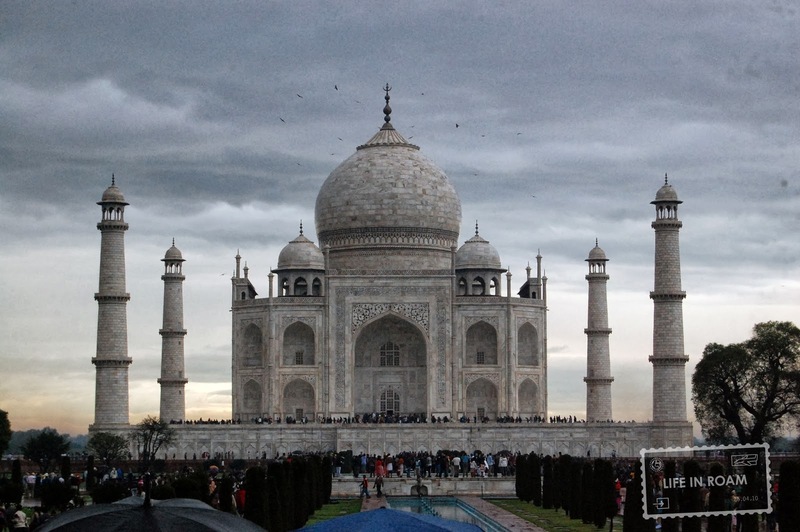 After 22 days of sunshine, of course the day we go to the Taj Mahal is the day that there is intense downpours of rain. And guess where our raincoats that we had lugged around were? Of course our hotel, we would look to put-together to not make that mistake. As we waited in line for tickets the skies dumped on us rain that quickly flooded the streets and our shoes. There was no where to hide, so we moved forward and tried to get into the park. Our group was separated (security in airports and parks check women in a different line), and we waited out the rain under a roof after the security. While we waited, even rats and a stray dog ran out from their hiding place to take cover amongst the shoes and people. After we recollected, our tour guide, who we were told was speaking English, though I don’t think anyone understood a word he was saying, lead us through the huge palace grounds. Jeff and I hung close to a German boy named Toby that we had befriended in the van ride with our shared enjoyment of witty banter. We giggled and snickered in the background, and instead I’ll rely on Wikipedia to inform me about the palace. The Taj Mahal palace began construction in 1632, and was commissioned by the mughal emperor Shah Jahan to commemorate his recently deceased wife. She died while giving birth to her 14th child. The palace is seen as a commemoration of his life and grief for her. Construction was finished in 1648. The building follows the persian style of architecture and is intricately decorated and carved, and the whole structure and the other buildings on the ground, are perfectly symmetrical. Up to the carvings as well. Inside the building are jewelled inlays, some of which had to be replaced over the years because they were removed by british soldiers and occupiers. You can tell which are not real jewels by shinning a small light to the base of the design. If the light is a beam through the jewel its a fake inlay, if the whole piece lights up, its a real jewel. 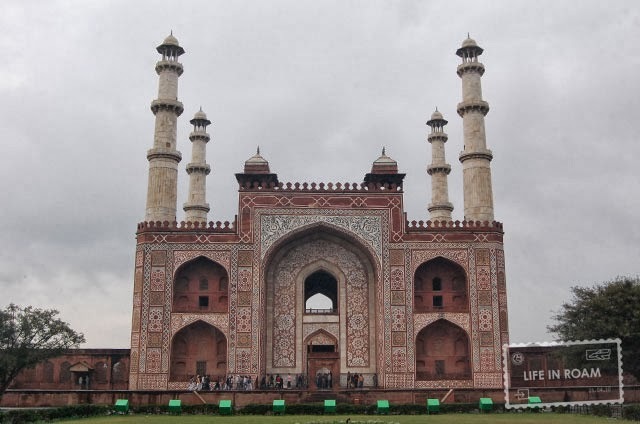 Shortly after the completion of the Taj Mahal, Shah Jahan was usurped by his son, Aurangzeb. I read the book City of Dijinns by William Dalrymple, and in his book he covers this families history. Apparently, Aurangzeb and his sister were the least favorite of Shah Jahan’s children, and openly criticized and dismissed by the emperor. Meanwhile, the emperor favored his eldest son, whom he was grooming for the thrown. Aurangzeb gathered a group of followers, with the help of his sister, and over threw the emperor and took the crown. 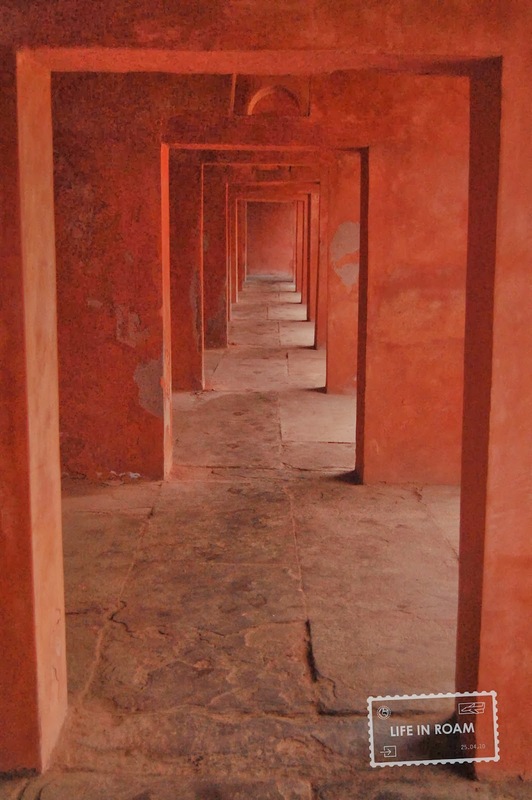 Shah Jahan was then held in Fort Agra, in a rumored mirror room. The mirrors in the room are placed in such a way as to give the fallen emperor a view of his intricate palace. If this seems like a generous effort on Aurangzeb’s part, don’t give it too much weight, as the he also gave Shah Jahan the head of his favorite son as well. 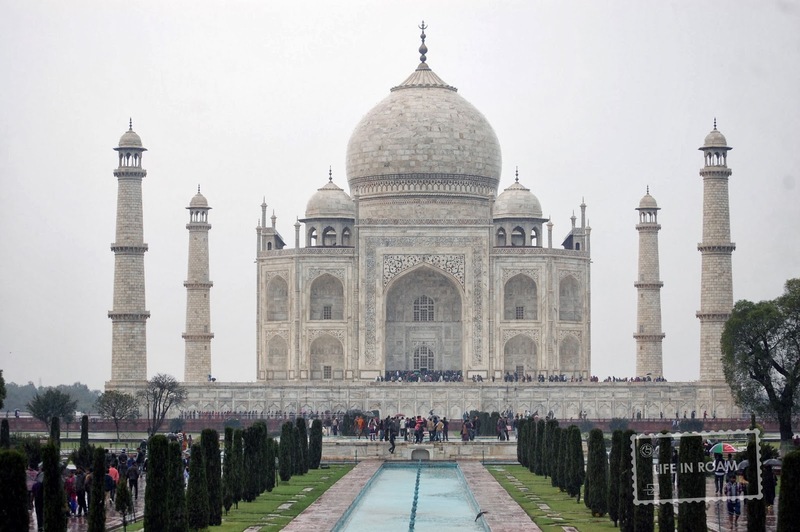 After Shah Jahan’s death he was laid to rest in the Taj Mahal next to his wife’s crypt. During times of war, the palace is covered in scaffolding to mislead air pilots and to try and protect the structure. Also due to lowering water levels of the river behind the palace, cracks have begun to appear in the structure of the minarets and crypt. Some speculate the building could collapse in as soon as 5 years. This is a building we stopped at on the way to Agra. I have no idea what its deal is. 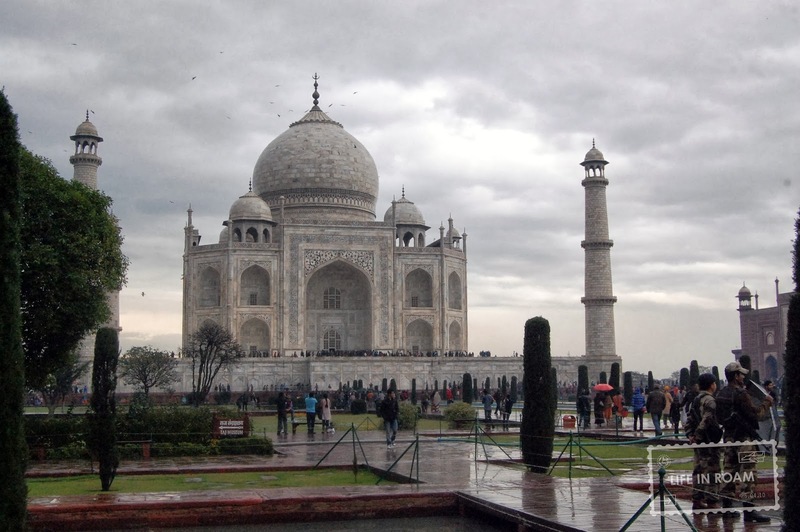 After the tour at the Taj Mahal, we were loaded into the van and taken to a thankfully warm restaurant where we compared wetness and soaked pieces of clothing. The van took us to a marble store, which showed us a quick example of how the marble is carved to be inlaid in the buildings. Then we sat there are they tried to sell us marble knick knacks of assured quality. 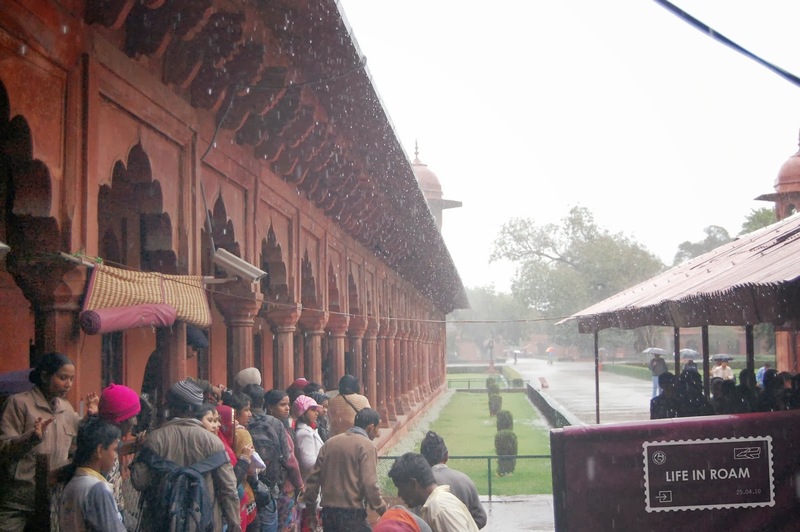 The whole group had to wait for the few people who did decide to buy the trinkets, and we missed being able to see the Agra Fort. I’m not entirely sure if it was because of the marble shop or not. We drove back to Delhi with the window down because the van couldn’t handle the moisture of all our wet bodies and the windows kept fogging. I huddled under newspaper to try and stay warm. In honor of the birders we met at the previous travel stop. 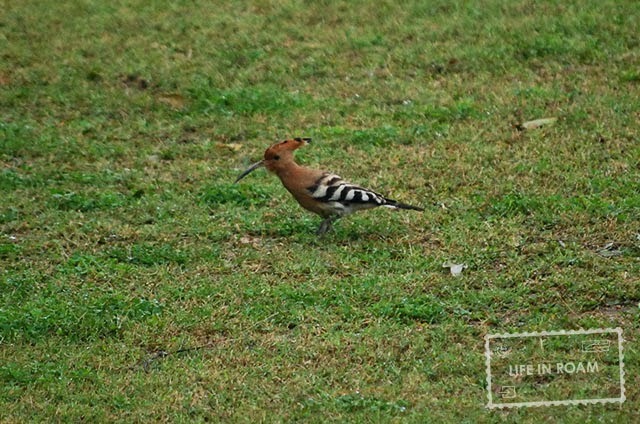 It is a Hoopoe. After the trip we invited Toby out for a few beers, and then ventured out to a shish-a bar for a few hours. It was an excellent conclusion to our trip, meeting another traveller and enjoying a nice evening. He unfortunately missed his walking tour the next morning, not because of hung-over-ness but instead because of confused-starting-time-ness. We, thankfully, made our flight and headed home to Paris. Where we promptly caught the flu, and spent many Google searches and WebMd’s trying to assure ourselves it was not malaria.